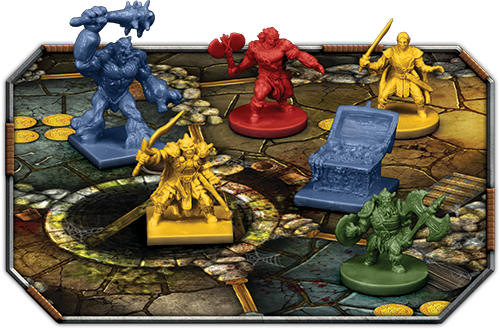 Gather your companions and enter the labyrinth in Cave Troll, a classic board game of heroes, monsters, and racing for treasure! In every game of Cave Troll, you command both heroes and monsters as you approach a dangerous dungeon in search of gold and treasure. Unfortunately, you are not left to pursue your goal unhindered. Up to three other players also control heroes and monsters, and they’re just as eager to race through the dungeon’s rooms and grab as much gold as possible. You'll use your heroes to grab gold from the dungeon, while your monsters can slay enemy heroes and disrupt your opponents' plans. To foil those who would keep you from your treasures, you’ll need to be in the right place at the right time, strategically positioning your heroes and dispatching your monsters to destroy your enemies. Gather your forces and enter the labyrinth! In Cave Troll, you’re not a single hero searching for treasure. Instead, you control both heroes and monsters as you fight your opponents for control of a labyrinthine dungeon. Each turn, you have four actions that you must use to gain every advantage. The first way that you can use an action is to draw a card and play a card from your hand. Playing cards brings new heroes and monsters into the maze, giving you more figures to command and spreading your area of influence in the dungeon. You can also spend an action to move a hero or a monster to an adjacent room in the labyrinth. Once your figures have entered the dungeon by playing a card, you must use move actions to spread your heroes throughout the dungeon and occupy different rooms. When the board is scored at various points throughout the game, you receive gold from every room where you have the most heroes. Even if you are the only player to have a hero in a room, you’ll still receive gold for that room when the board is scored. By moving your heroes strategically, you can claim new rooms and overwhelm your opponents’ heroes in contested rooms. In Cave Troll, you can’t just grab the gold as soon as your heroes arrive in a room, however. Gold is collected when the board is scored, which happens at specific points throughout the game. Some of the cards that you play from your deck have one or more scoring icons at the bottom of the card. 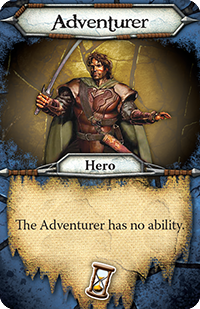 As an example, the Adventurer card shown to the right has one scoring icon. Cards with scoring icons are set aside, and when five scoring icons have been played, every room on the board is scored. If you have the most heroes in a room when the board is scored, you earn an amount of gold equal to the number of gold coins printed on the room. For example, in the diagram below, the red player has two heroes in the room, while the blue and yellow players each have one hero. 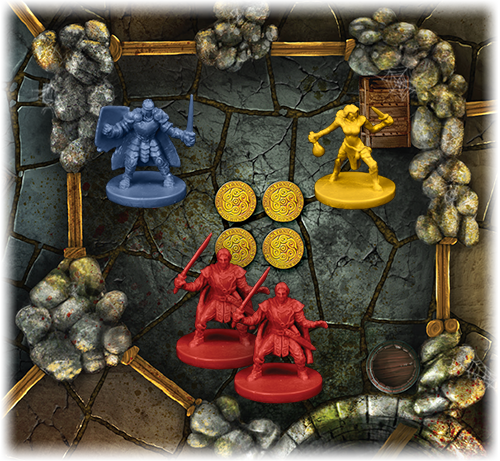 Because the red player has the most heroes in the room, he receives four gold from the room because there are four gold coins printed on the room. Of course, you want the board to be scored at the best times for you. By playing the cards in your hand wisely, you can delay scoring when you’re at a disadvantage and push toward scoring when your heroes are in position. In order to grab the most loot and achieve victory in a game of Cave Troll, you’ll need to call upon an assortment of heroes. You’ll use all of these heroes to control rooms throughout the dungeon and their unique talents can give you a distinct advantage, provided you use them wisely. For example, your Dwarf doubles the gold value of any room he occupies, giving you the opportunity to dramatically increase the amount of gold you gain. 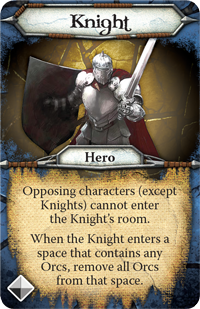 The Knight , on the other hand, prevents opposing characters from entering his room, essentially declaring a crucial room off-limits to your opponents’ figures. You’re not just a hero engaged in a dungeon-delving adventure in Cave Troll. You’re here to claim as much gold as possible by any means possible. You’ll need to enlist the services of dread monsters to disrupt your opponent’s plans. 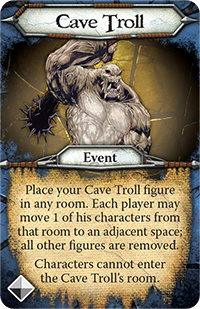 A mighty Cave Troll can burst into a room, devouring heroes and keeping any other figure from entering for the remainder of the game. 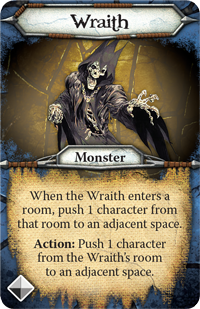 Alternatively, you may summon a Wraith , terrifying other heroes and monsters and pushing them out of key rooms. With these and other monsters, you can push your opponents further away from victory. 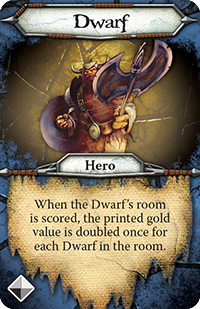 In addition, two distinct versions of Cave Troll offer different abilities for your heroes and monsters. 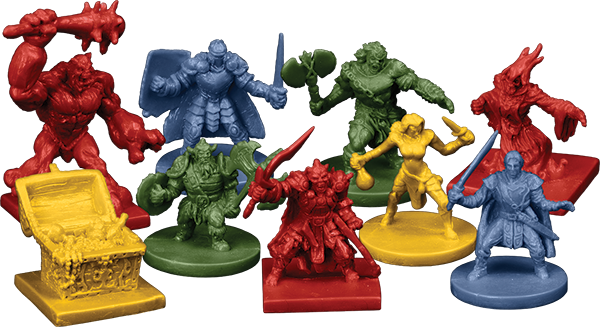 You can play with the classic game and use the original abilities, or you can change these figures’ abilities by playing the variant game, which was first introduced in the second edition of the game. The replayability offered by these two game modes offers a different experience every time you enter the dungeon. Gold coins are not the only treasures that lie within the twisted tunnels and dark rooms of the dungeon. You’ll also find artifacts with arcane powers that can grant you a definite advantage in your games. 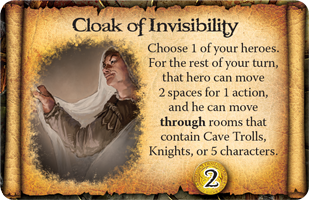 For example, you may unveil a Cloak of Invisibility , allowing your character to move through previously inaccessible rooms, sneaking past rampaging Cave Trolls and vigilant Knights. 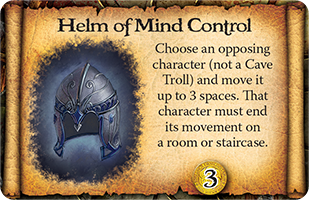 Alternatively, you may take up the Helm of Mind Control and use its dark powers to move an opponent’s character into deadly peril. Of course, it’s not always clear when you should use an artifact. You’ll only find one artifact in the course of an entire game, and once you use it, its power is lost forever. What’s more, if you choose not to use an artifact during the game, it contributes some additional gold toward your ultimate victory. In every game of Cave Troll, you’ll have to decide if you want to use your artifact and how you can put it to the best use. The labyrinth lies before you, filled with gold for anyone to claim. If you wish to emerge more wealthy than any of your opponents, you’ll have to spread your heroes strategically throughout the dungeon and destroy your opponent’s plans with your monsters. Gather your heroes and monsters and face the dangers in the cave trolls’ lair! The copyrightable portions of Cave Troll are © 2015 Fantasy Flight Publishing, Inc. Cave Troll is a TM of Fantasy Flight Publishing, Inc.